Easter is only a few days away, despite weather giving us no indication, and with Easter, come the usual worries: What type of chocolate should I buy? What if they don’t like chocolate? What should I serve on the day? What drinks should I be getting? I have not booked something yet but I would love to get away from London. Where could I possibly go at such short notice? Yes, a Fabergé egg would be a perfect gift but if you are not one of the lucky people working for one of the big banks who gave their employees millions in bonuses, it might be a little out of your league. What else could you lavishly dish out which won’t cost you an arm and a leg? Don't worry; here are some affordable ideas which might do the trick. Leading French Chocolatier Jeff de Bruges has now opened its Flagship boutique in the heart of Mayfair in London South Molton Street. By combining the culinary culture of Belgian Chocolate and the chic flamboyancy of French chocolate, it constantly explores new avenues for new recipes and new ideas. 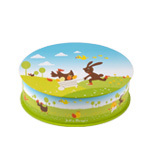 · For instance, they have a fun filled and quality range of Easter chocolates . We particularly liked the animal shaped ones. The lamb basket is wicked! · A beautiful selection of chocolates with stunning chocolate bouquets, consisting of 7 individual stems. Note: All their covering chocolate is free from hydrogenated fat and vegetable fat. Only pure cocoa butter is used. La Maison du Chocolat, with over thirty years of expertise and ever evolving creativity is a prestigious French chocolate factory. They offer handmade chocolates using the finest and freshest ingredients (no preservatives are used, so most have a limited shelf-life). Flavours are subtle yet profound, and packaging is exquisite. 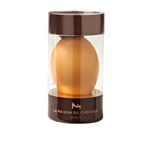 The La Maison du Chocolat egg box is a beautiful, caramel coloured egg-shaped box creation filled with small Eggs praline and small ganache eggs. The La Maison du Chocolat egg box is a beautiful, caramel coloured egg-shaped box which opens to reveal a delightful selection of creations. 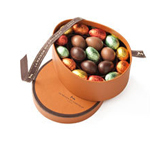 Inside, sitting on a nest of fine chocolates, is a delicious Easter egg, surrounded by smaller, delicate praline eggs. An Egg shell filled with a delicious dark praline! 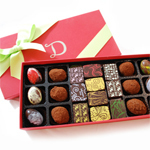 A luscious selection made from the highest quality ingredients is the secret of this chocolatier's success. 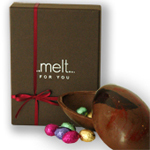 From gorgeous truffles to heavenly bonbons, Melt will appeal to all your senses. Every chocolate concoction is made fresh on the premises and many of them are created from organic ingredients. 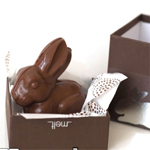 The very pretty rabbit is named after their real rabbit Bibi, she was launched last year – as she is still alive they are again paying homage to bright, good natured Bibi. Chocolate Bibi is a pain in the neck to make and is very labour intensive – so grab her soon while stocks last! Handmade in their kitchen and then hand painted by their team of chocolatiers, this beautiful egg is the perfect chocolate gift for Easter. 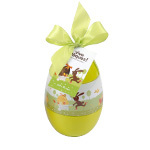 Filled with delicious, fine quality milk chocolate eggs. 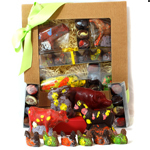 High quality chocolaterie in London, they offer original handmade creations. A fun extra thick Easter egg for all the family! 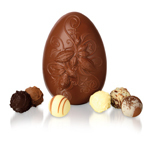 One half of the egg shell is made with a milk and white chocolate fusion, and the other in mellow 40% milk chocolate. 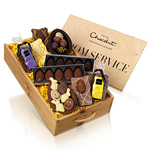 Inside is bursting with 12 chocolates; smiley face pralines with orange and crunchy biscuit, chocolate brownies, half eggs with vanilla and strawberry mousse, and bunnies and chicks cast in milk and white chocolate. This gorgeous Easter egg provides the essential silky soft truffle experience; cast from extremely chocolaty 50% cocoa milk chocolate in an exclusive cocoa pod design. The accompanying chocolates are silky soft cream ganaches encased in crisp chocolate shells with champagne, Tiramisu, café latte, Calvados, cointreau and rum. 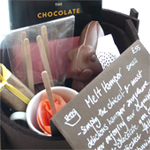 Packed with chocolate specialities this hamper makes an ideal gift for families and offices to share. Award-winning British chocolatier Marc Demarquette hand-makes each one using traditional artisan techniques in his West London Chocolaterie. 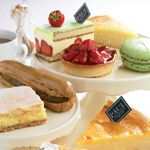 He worked at the prestigious Maison Lenôtre in Paris and learnt with a number of Master Chocolatiers in France. To celebrate Easter, Marc Demarquette has been inspired by the 'pop-art' movement to create a range of colourful hand-painted Easter eggs and farm animals. Each and every one is entirely unique and hand made using only the highest quality cocoa: the exclusive multi award-winning Cao Grande Chocolate from Valrhona. Each and every Flavoured Quails Egg is entirely unique and hand-made using only the highest quality cacao: the exclusive multi award-winning Cao Grande Chocolate from Valrhona. They are brightly hand painted and filled with luxurious real fruit caramel. 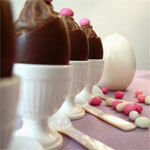 * The milk chocolate egg flavours are the succulent Peach & Apricot, aromatic Strawberry and sensuous Vanilla. 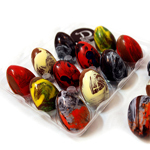 * The dark chocolate egg flavours are the exotic tropical Passion Fruit & Mango, delicate Salt and the scrumptuous flavour of just-picked Mixed Berries. 12 eggs are presented in a clear box. 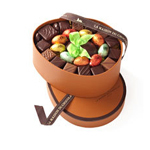 'Demarquette Easter Box' offers you an assortment of chocolate favourites from the artisan Demarquette Chocolaterie. 'Taste the World through Chocolate' with 20 of their classic Ganache Chocolates, hand chosen by award-winning Chocolatier Marc Demarquette on the day. 6 hand-rolled House Truffles will melt in your mouth with their luxuriosly creamy texture, and the 6 Caramel Easter Quail Eggs (Milk Chocolate & Strawberry, Milk Chocolate & Vanilla, Milk Chocolate and Peach & Apricot, Dark Chocolate & Sea Salt, Dark Chocolate & Mango & Passion Fruit, Dark Chocolate & Mixed Berries) make this the perfect Easter indulgence. 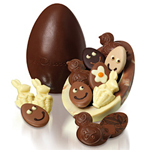 The eggs are hand-made using a special recipe of fresh fruit and cream with the multi award winning Cao Grande Chocolate (Milk 39% and Dark 70%) to maximise your enjoyment. Inspired by the likes of Andy Warhol and Keith Haring, the colourful Easter Farm Animals will certainly delight and brighten up any Easter Egg Hunt for all ages. Each and every one is entirely unique and hand made using only the highest quality cocoa: the exclusive multi award-winning Cao Grande Chocolate. Marjory Cow, Percy Pig, Lally the Lamb and Bunty Bunny. The purple & orange milk chocolate bite-size chicks have a Peach & Apricot Caramel filling and the green &yellow dark chocolate chicks are filled with Passion Fruit & Mango Caramel. To ensure the freshest taste and ultimate texture, Marc uses real fruit rather than fruit essence for the exquisite caramel filling. Milk Chocolate & Strawberry, Milk Chocolate & Vanilla, Dark Chocolate & Sea Salt, Dark Chocolate & Mixed Berries. Come to PAUL for all your Easter treats! Your treasure hunt will end here with their selection of Easter goodies for all the family. One of the best bread makers in town. Give your children a fun, eco-friendly Easter! Let's them be creative! Give them a chance to be more actively involved in decorating the house to celebrate Easter! Petit Artisan's craft kits are original, fun to make and play with, eco-friendly, and can be used for many years to come. Does the chocolate rabbit go uneaten because they just can't bear to bite off its head? That is the solution! 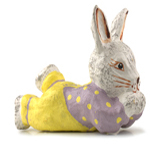 Solid, light and sturdy rabbit to paint and to decorate (size cm: 12x8.5x5). Very popular with children who love to play with it once painted. 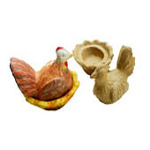 Sturdy and lovely eco-friendly HEN Box that opens up.(Size:18x15x10cm). Made of papier mache with recycled newspaper (water and paper no chemicals). Use of acrylic paint (water) is recommended.A lovely personal item to paint or decorate with transfer paper, decoupage, or glitter. 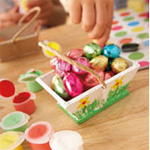 The perfect craft project to entertain children for Easter. Ideal for family craft activities and for party bags.